2 #2 Time First of all, there is a difference in telling time and telling at what time something is going to happen. First of all, there is a difference in telling time and telling at what time something is going to happen. 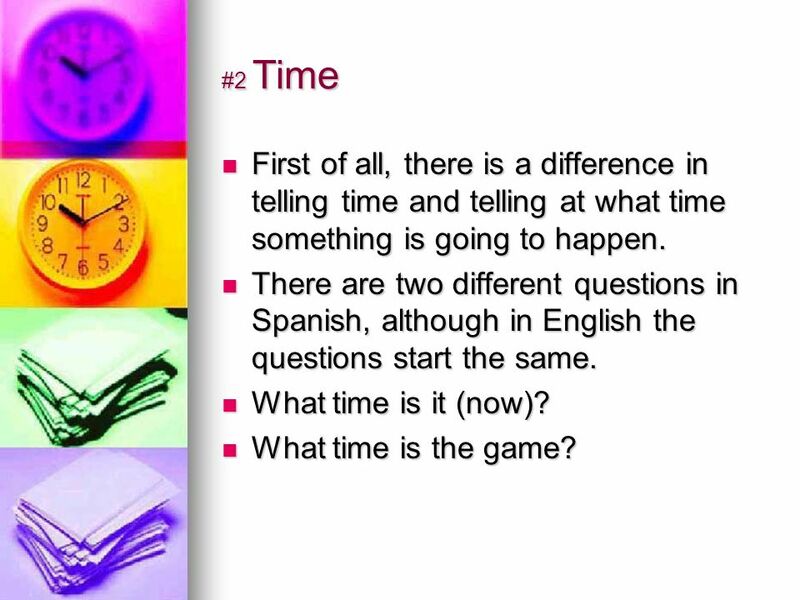 There are two different questions in Spanish, although in English the questions start the same. There are two different questions in Spanish, although in English the questions start the same. What time is it (now)? What time is it (now)? What time is the game? What time is the game? 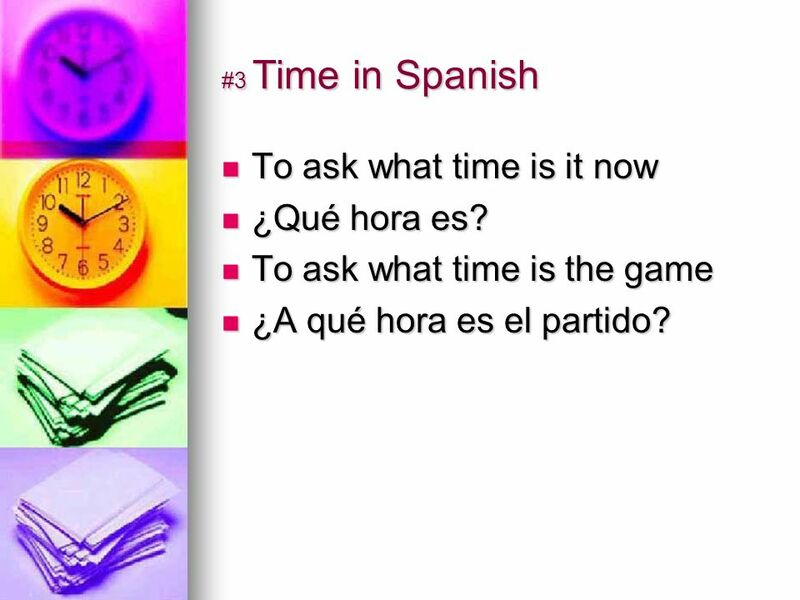 3 #3 Time in Spanish To ask what time is it now To ask what time is it now ¿Qué hora es? ¿Qué hora es? To ask what time is the game To ask what time is the game ¿A qué hora es el partido? ¿A qué hora es el partido? 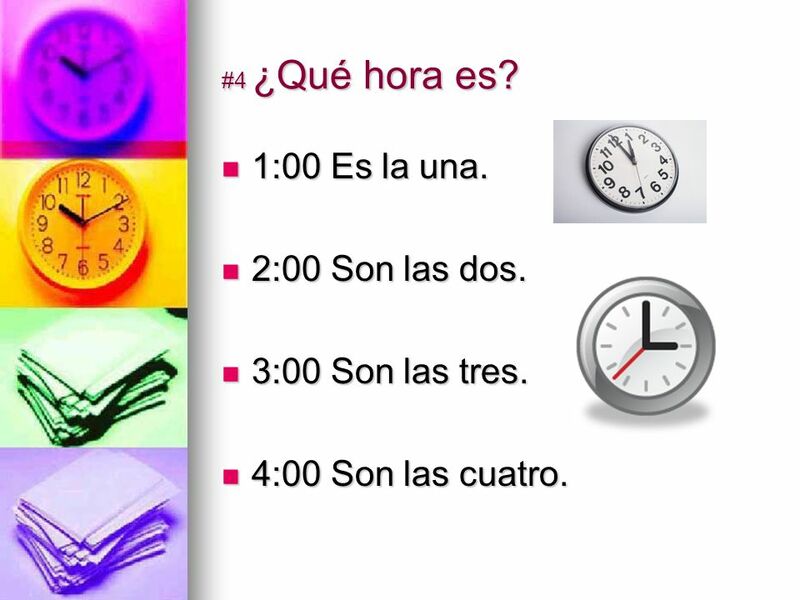 4 #4 ¿Qué hora es? 1:00 Es la una. 1:00 Es la una. 2:00 Son las dos. 2:00 Son las dos. 3:00 Son las tres. 3:00 Son las tres. 4:00 Son las cuatro. 4:00 Son las cuatro. 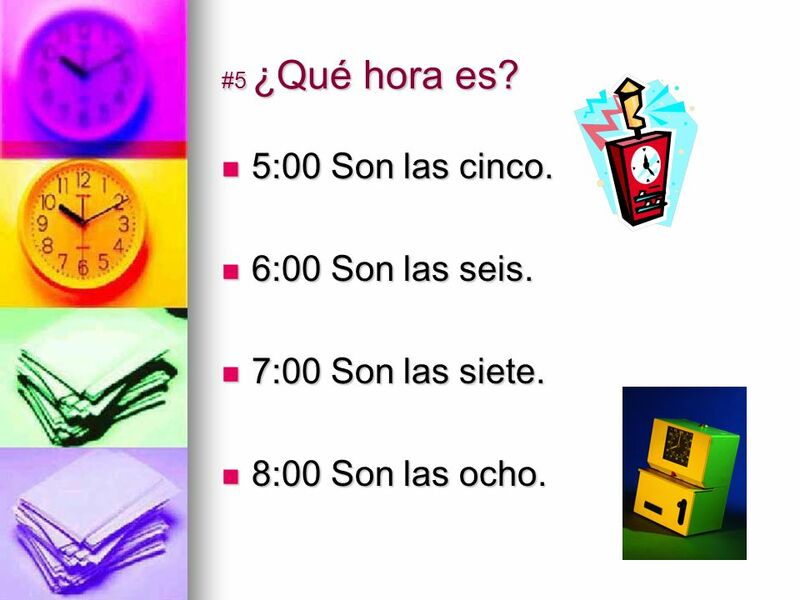 5 #5 ¿Qué hora es? 5:00 Son las cinco. 5:00 Son las cinco. 6:00 Son las seis. 6:00 Son las seis. 7:00 Son las siete. 7:00 Son las siete. 8:00 Son las ocho. 8:00 Son las ocho. 6 #6 ¿Qué hora es? 9:00 Son las nueve. 9:00 Son las nueve. 10:00 Son las diez. 10:00 Son las diez. 11:00 Son las once. 11:00 Son las once. 12:00 Son las doce. 12:00 Son las doce. 7 #7 To add minutes There are two ways to tell time. There are two ways to tell time. The traditional way The traditional way From 1 minute to 30 minutes use y (and) between the hour and number of minutes. 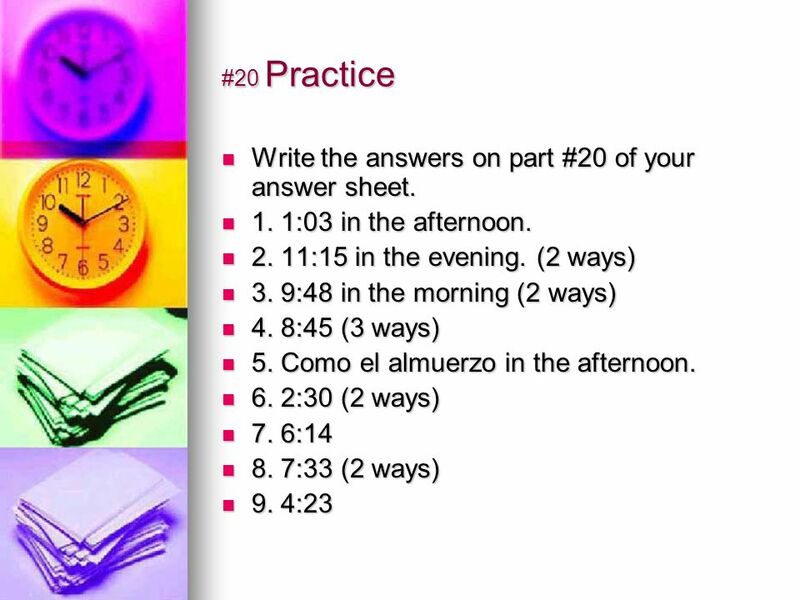 From 1 minute to 30 minutes use y (and) between the hour and number of minutes. Between 31 minutes to 59 minutes go to the next hour and subtract back. Use menos (less) between the hour and the number of minutes to the next hour. Between 31 minutes to 59 minutes go to the next hour and subtract back. 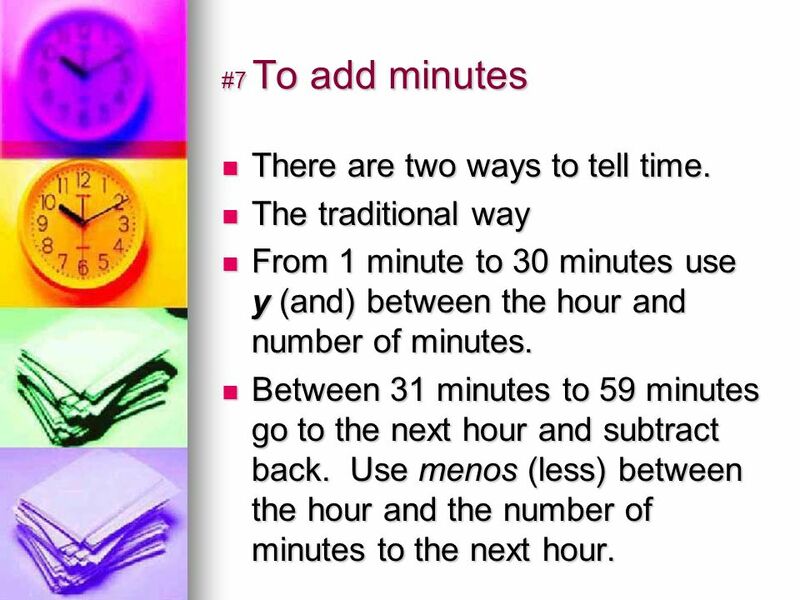 Use menos (less) between the hour and the number of minutes to the next hour. 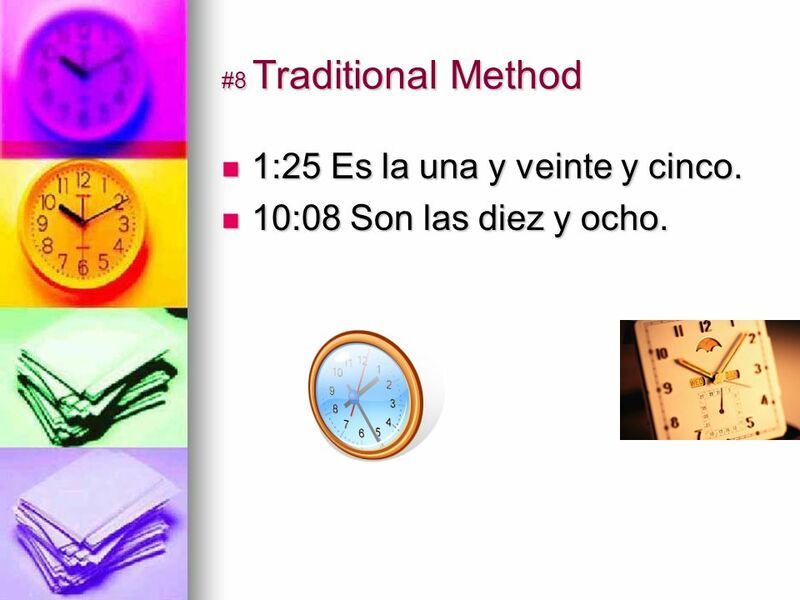 8 #8 Traditional Method 1:25 Es la una y veinte y cinco. 1:25 Es la una y veinte y cinco. 10:08 Son las diez y ocho. 10:08 Son las diez y ocho. 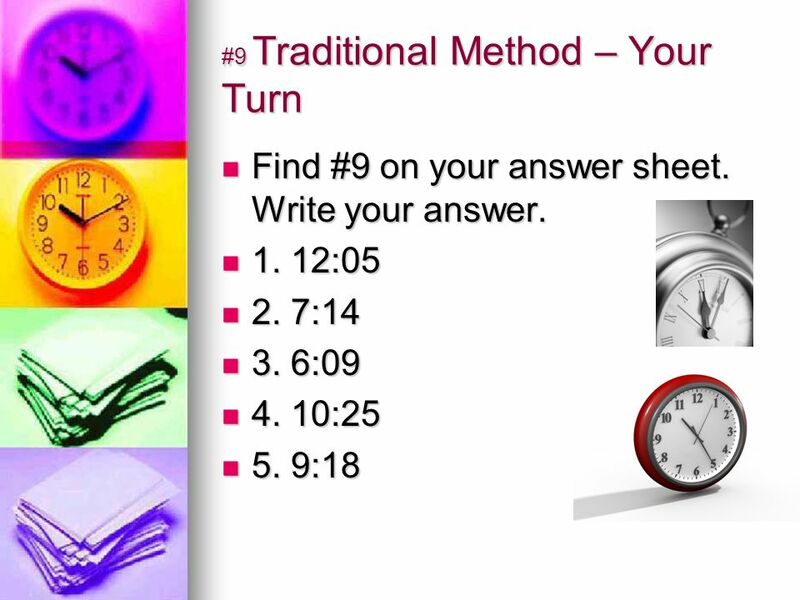 10 #10 Traditional Time 12:50 What is the next hour after 12:00? 12:50 What is the next hour after 12:00? It is 1:00. It is 1:00. How many minutes will it take to get from 50 minutes to 60 minutes? How many minutes will it take to get from 50 minutes to 60 minutes? 10. 10. 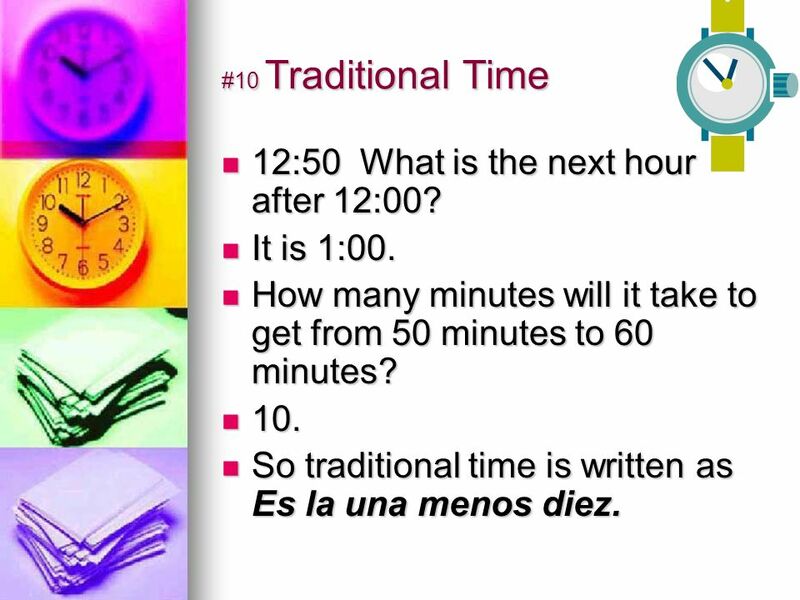 So traditional time is written as Es la una menos diez. 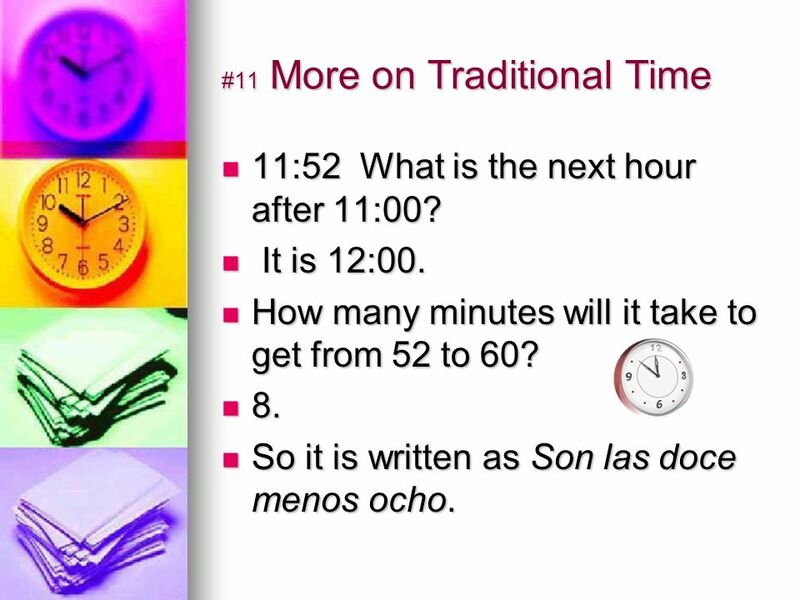 So traditional time is written as Es la una menos diez. 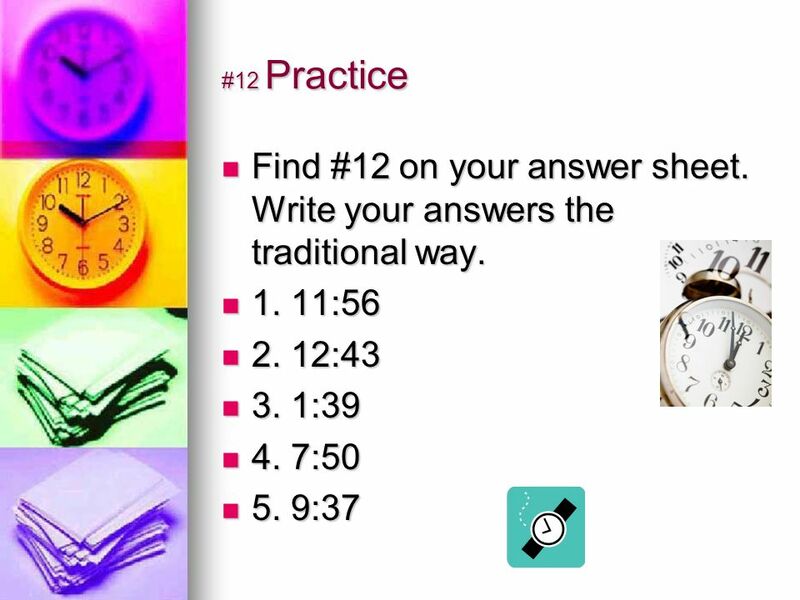 11 #11 More on Traditional Time 11:52 What is the next hour after 11:00? 11:52 What is the next hour after 11:00? It is 12:00. It is 12:00. How many minutes will it take to get from 52 to 60? How many minutes will it take to get from 52 to 60? 8. 8. So it is written as Son las doce menos ocho. So it is written as Son las doce menos ocho. 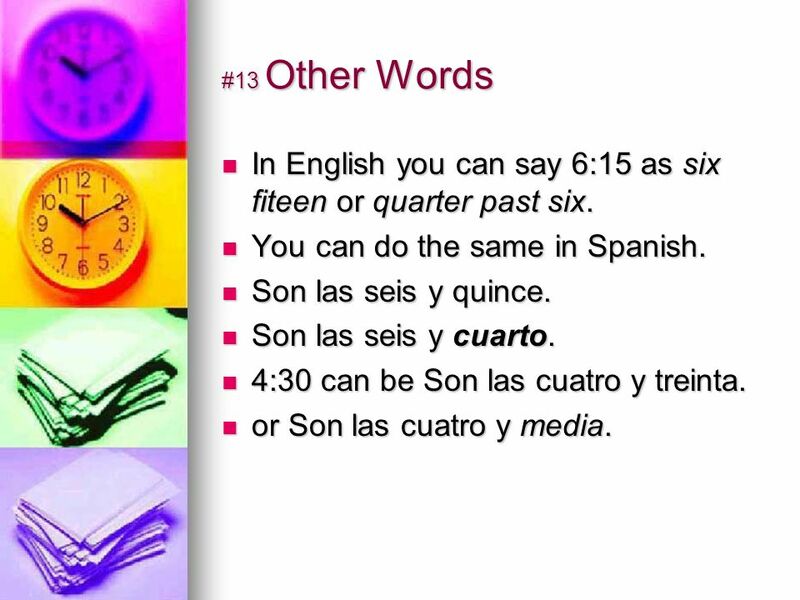 13 #13 Other Words In English you can say 6:15 as six fiteen or quarter past six. In English you can say 6:15 as six fiteen or quarter past six. You can do the same in Spanish. You can do the same in Spanish. Son las seis y quince. Son las seis y quince. Son las seis y cuarto. Son las seis y cuarto. 4:30 can be Son las cuatro y treinta. 4:30 can be Son las cuatro y treinta. or Son las cuatro y media. or Son las cuatro y media. 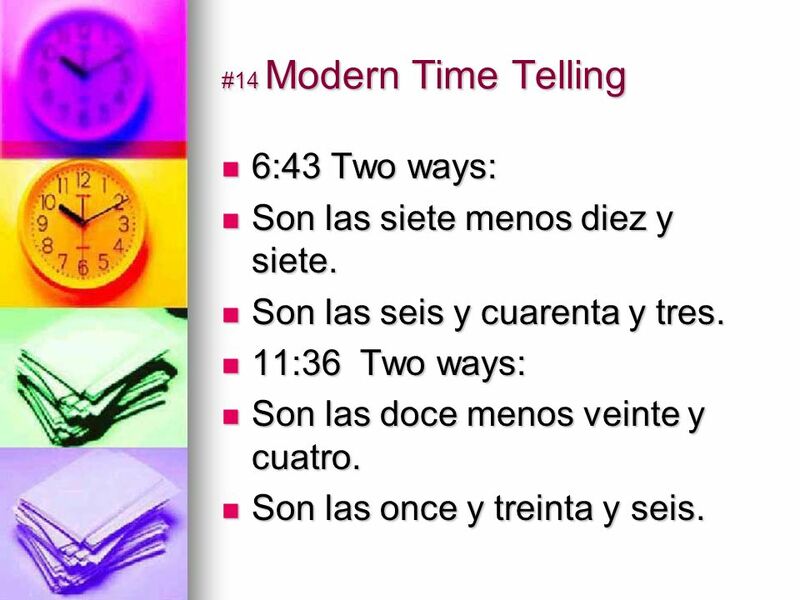 14 #14 Modern Time Telling 6:43 Two ways: 6:43 Two ways: Son las siete menos diez y siete. Son las siete menos diez y siete. Son las seis y cuarenta y tres. Son las seis y cuarenta y tres. 11:36 Two ways: 11:36 Two ways: Son las doce menos veinte y cuatro. Son las doce menos veinte y cuatro. Son las once y treinta y seis. Son las once y treinta y seis. 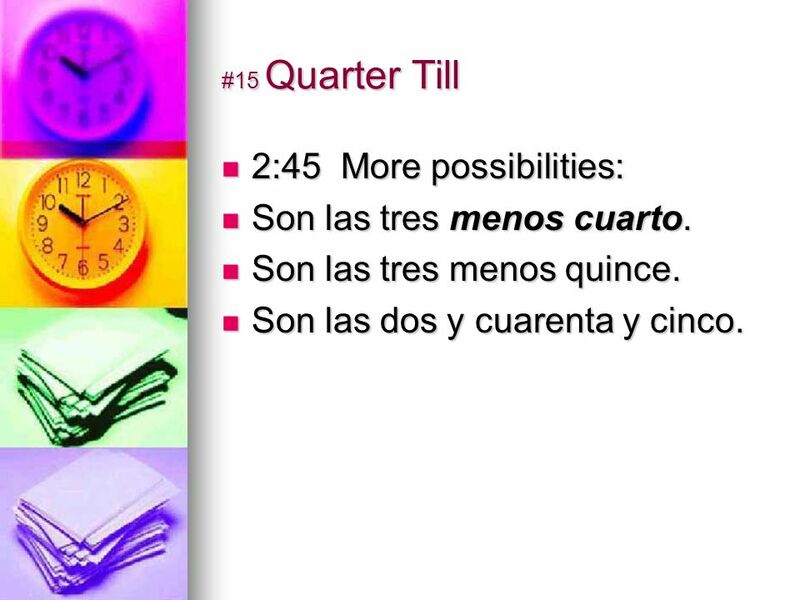 15 #15 Quarter Till 2:45 More possibilities: 2:45 More possibilities: Son las tres menos cuarto. Son las tres menos cuarto. Son las tres menos quince. Son las tres menos quince. Son las dos y cuarenta y cinco. Son las dos y cuarenta y cinco. 16 #16 In Review Remember you can add minutes using y. 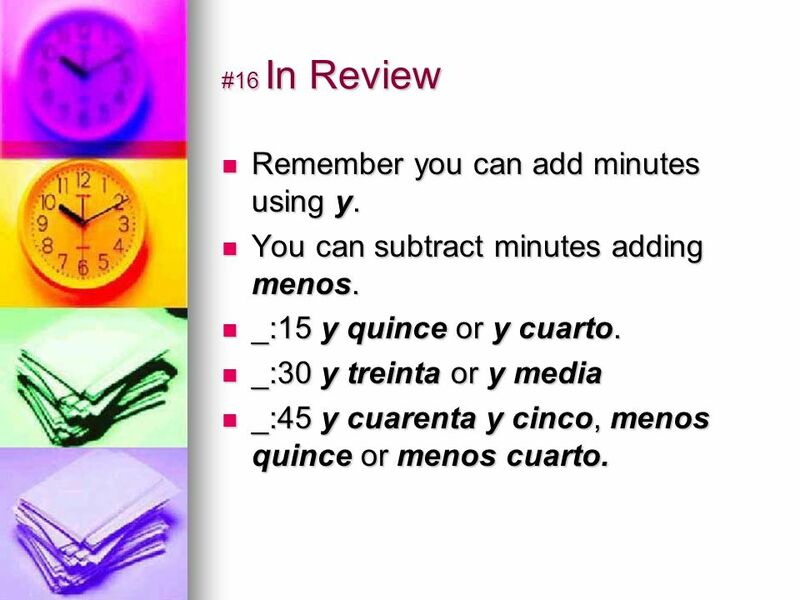 You can subtract minutes adding menos. _:15 y quince or y cuarto. _:30 y treinta or y media _:45 y cuarenta y cinco, menos quince or menos cuarto. 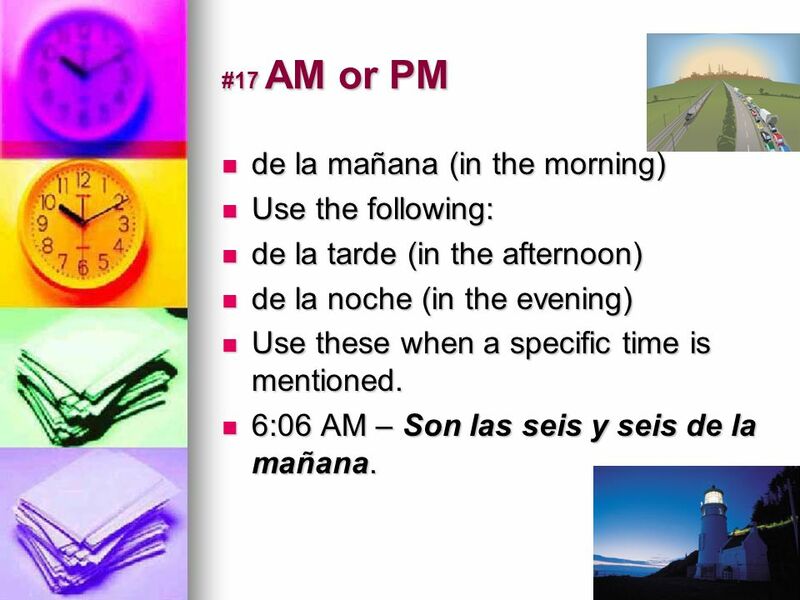 17 #17 AM or PM de la mañana (in the morning) de la mañana (in the morning) Use the following: Use the following: de la tarde (in the afternoon) de la tarde (in the afternoon) de la noche (in the evening) de la noche (in the evening) Use these when a specific time is mentioned. Use these when a specific time is mentioned. 6:06 AM – Son las seis y seis de la mañana. 6:06 AM – Son las seis y seis de la mañana. 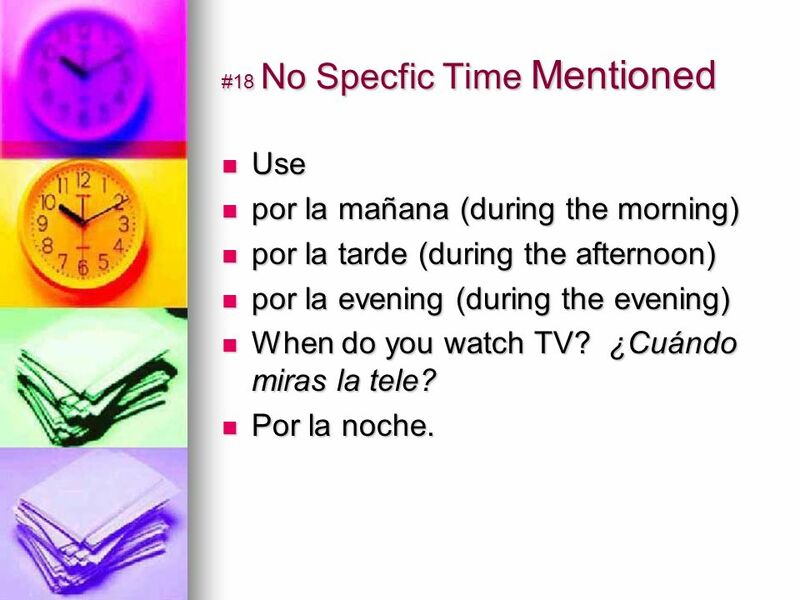 18 #18 No Specfic Time Mentioned Use Use por la mañana (during the morning) por la mañana (during the morning) por la tarde (during the afternoon) por la tarde (during the afternoon) por la evening (during the evening) por la evening (during the evening) When do you watch TV? ¿Cuándo miras la tele? When do you watch TV? ¿Cuándo miras la tele? Por la noche. Por la noche. 19 #19 Reviewing Time It is 1:00. Es la una. It is 1:00. Es la una. It is 2:00. Son las dos. It is 2:00. Son las dos. Did you notice the verb change? Did you notice the verb change? y cuarto, y media, and menos cuarto. y cuarto, y media, and menos cuarto. 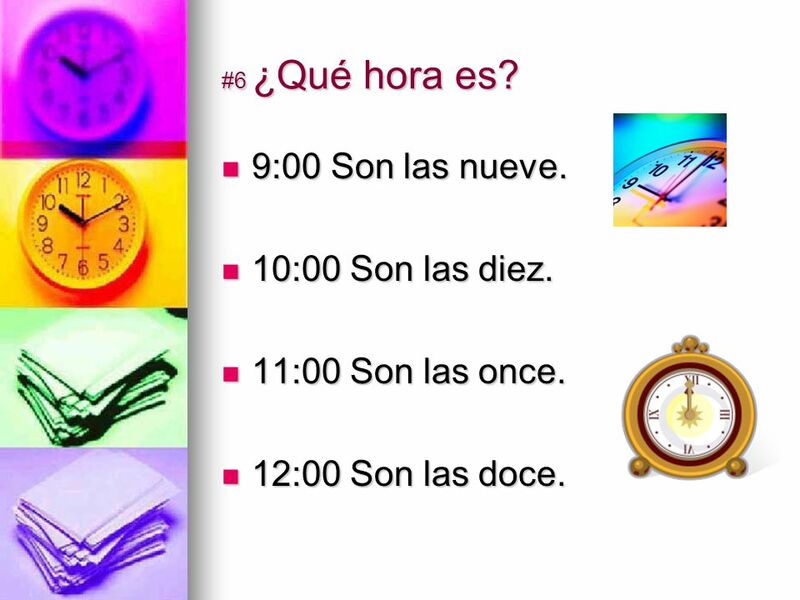 de la mañana, de la tarde, de la noche used when a specific time is given de la mañana, de la tarde, de la noche used when a specific time is given por la mañana, por la tarde, por la noche used when a specific time is not mentioned. por la mañana, por la tarde, por la noche used when a specific time is not mentioned. 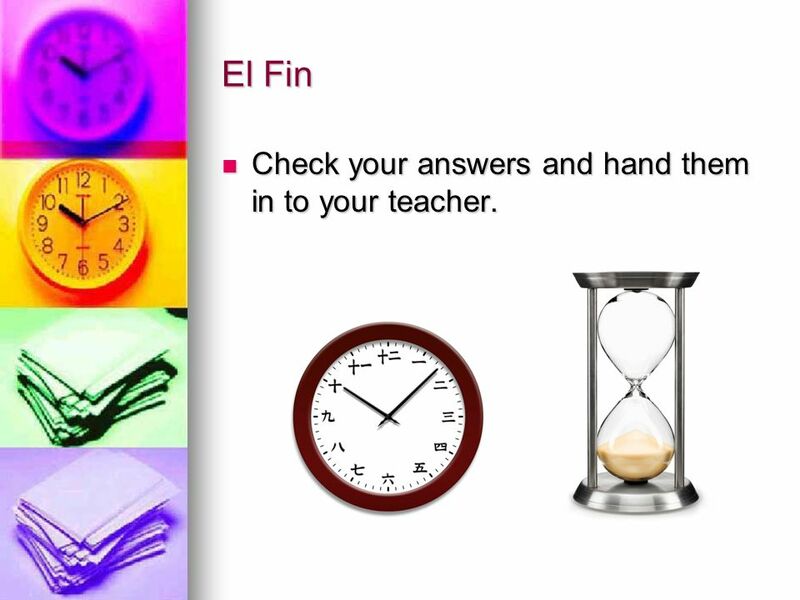 21 El Fin Check your answers and hand them in to your teacher. Check your answers and hand them in to your teacher. 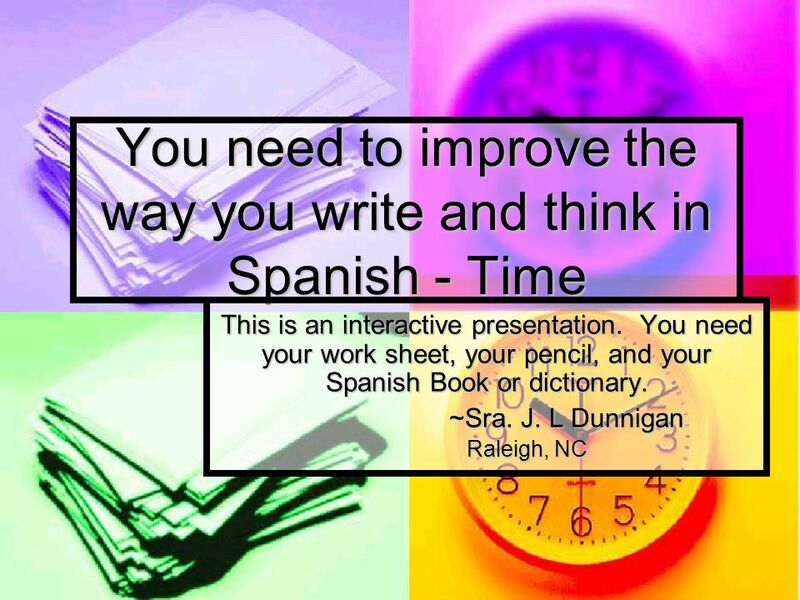 Descargar ppt "You need to improve the way you write and think in Spanish - Time This is an interactive presentation. You need your work sheet, your pencil, and your." Which verb is used? 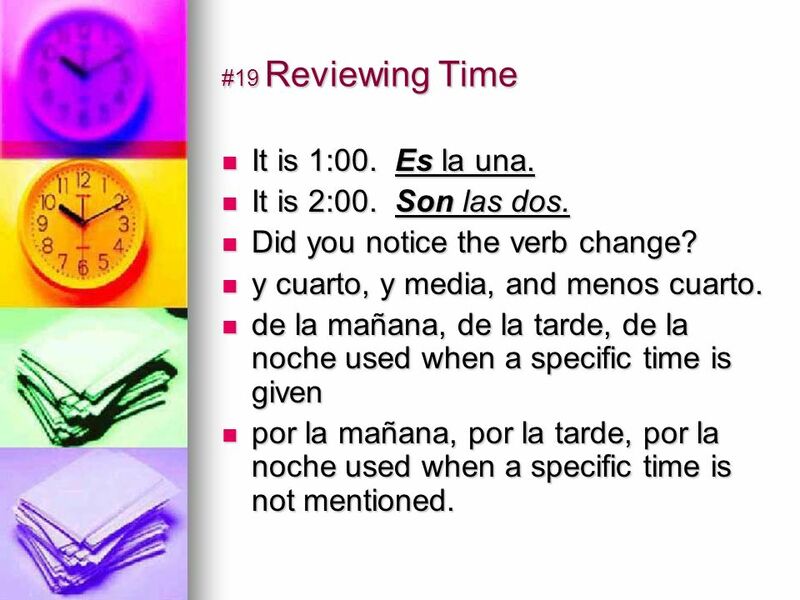 To tell the time in Spanish, you should use ¨ Ser ¨verb Third person singular or plural conjugation is used, depends on what time.